As a cat owner, it's important that you understand how to prevent feline obesity. If your cat is overweight or obese, she is vulnerable to a number of serious health problems, but you can prevent them by monitoring her diet and exercise. Dr. Ward first grew interested in preventing disease through helping pets maintain physical fitness about four years after he began working as a veterinarian. He founded his own veterinary practice called Seaside Animal Care, and he also writes books and speaks around the country about animal health. He has been featured on programs like The Rachel Ray Show and NBC Nightly News. 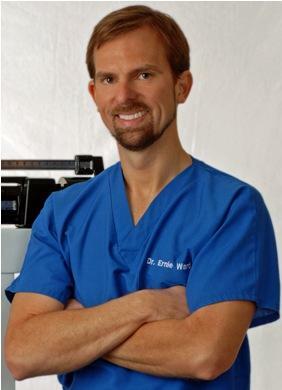 LoveToKnow (LTK): Dr. Ward, you have an impressive background of advocating for animals that don't have a voice. You have been instrumental in implementing several guidelines for veterinarians to use in their practices. Can you share a little with us about this work? Dr. Ernie Ward (Dr. W.): I've known I wanted to be a veterinarian since I was "knee-high to a grasshopper". Part of my love for veterinary medicine has been the desire to innovate and share ideas with other vets. I've been very fortunate to have been on the cutting edge of several changes over the past two decades. My overarching goal is to do what is in the pet's best interest. The most important thing we can do as humans is help each other - both people and the animals we share our lives with. LTK: Are some breeds more likely to become overweight than others? Dr. W.: Sadly, the Association for Pet Obesity Prevention currently estimates about 58 percent of all cats are too heavy. This means obesity is an equal opportunity affliction. LTK: Does gender or spaying and neutering have anything to do with a cat's tendency toward becoming overweight? Dr. W.: Spaying or neutering lowers a cat's metabolic rate. If we continue to feed them a "normal" amount of calories, what you typically see on food feeding guides, you'll be feeding them 25 percent to 35 percent too much. LTK: Why are our felines getting fatter? Dr. W.: Dogs, cats and people are all getting fatter for basically the same reasons: eating too much and exercising too little. Cats, in particular, are being fed too much. In addition, many cats overeat out of boredom or stress. What's there to do but hang out by the all-day buffet? Couple this with a largely sedentary indoor, hang-out-by-the-window lifestyle, and we've got the perfect recipe for fat felines. LTK: What are some of the problems associated with cat obesity? Dr. W.: While some people mistakenly believe that "fat cats are happy cats", the fact is these extra pounds are robbing pets of precious years and costing us millions in medical bills. Chronic diseases such as diabetes, arthritis, high blood pressure, kidney failure and many cancers are associated with excess weight. Keeping your pet at a healthy weight not only helps him live a long, pain-free life, it also saves you money. LTK: Today's cat lives in a catch-22 world. Going outside is dangerous, but staying inside full-time can create a weight problem. How can owners recognize if their cat is a "fat cat"? Dr. W.: The first step toward tackling obesity is to determine if your pet is portly. The simplest way to do this is to feel your pet's ribs. You should be able to easily feel the ribs under a thin layer of skin. If you find yourself digging through jelly, your pet's probably too heavy. Another easy way to tell if your cat needs to shed a few pounds is to look at it from the side. Does the belly hang down? A sagging stomach indicates excess abdominal or belly fat, the most dangerous type of fat tissue. We call these cats "Swiffer Cats" because they're constantly mopping the floor with their dragging bellies! If you observe either sign, it's time to see your veterinarian about putting your best friend on a weight loss program. LTK: What can owners do to encourage their cats to lose weight? Dr. W.: The most important tool a pet owner has in the fight against obesity is a measuring cup. Knowing how many calories your cat needs and how many you're feeding are critical steps toward maintaining a healthy weight. Too many cat owners simply fill the bowl or feed "about a cup". Feeding as few as ten extra kibbles per day can add up to about a pound of weight over a year for most indoor cats. Most adult, spayed or neutered indoor cats only need about 180 to 210 calories per day - that's not a lot! You can't go by the feeding guides on foods; they're formulated for active, intact cats. If you feed by these guidelines you're often feeding 25 to 35 percent too much food. Feeding a high protein diet also helps. I typically encourage cat owners to feed a no-grain or low-grain diet whenever possible. Play with your cat. Just because cats don't jog doesn't mean we shouldn't get them moving. Try laser pointers, remote-controlled mice and food puzzles to engage the feline mind and body. Two or three five-minute play sessions a day can greatly improve your cat's health and help shed unwanted pounds. LTK: I have a fat cat myself. I tried to give her diet cat food, and she just ate more of it. I try to encourage her to play; she does for a minute, but then flops down. Any ideas for helping a diet-resistant, activity-resistant feline? Dr. W.: It's important to remember who rules the food bowl - we do! It's up to pet owners to be good stewards of healthy feeding. Cats don't jog; when it comes to weight loss in cats, food rules. Most cats will lose weight (and be satisfied) on a high protein, low-calorie diet. Try to engage them in play by using interesting toys. Many cats will benefit from eating out of food puzzles or being fed small portions out of soy sauce bowls placed throughout your house (engage their inner hunter!). Gradual weight loss in cats is safest; most cats can lose about half a pound per month on a good low-calorie diet. LTK: Do you have any other tips for preventing obesity in cats? Dr. W.: The fight against feline obesity is about caring for our pet loved ones in the best possible manner. The most important thing cat owners can do is understand how many calories their cat needs and feed accordingly. Unfortunately, you can't trust the feeding guides on pet foods. These guidelines are formulated for active, un-spayed or un-neutered dogs and cats. If you share your home with an older, spayed or neutered pet, chances are the suggested feeding amount is too much. Visit PetObesityPrevention.com to get a general idea about how many calories your pet should be fed. It's probably less than you'd guess. Finding calorie counts for treats gets tricky; most manufacturers don't put the calorie content on the package. Why? They aren't required to. This is a regulatory loophole that needs to be closed. I encourage every pet lover to write or call AAFCO and the FDA and demand calorie content be placed on pet foods and treats. LoveToKnow Cats thanks Dr. Ernie Ward for taking time out of his busy schedule to share these tips on preventing and curing feline obesity. You can learn more about Dr. Ernie's work and books at DrErnieWard.com.